Michele is newer to Power Ryde. By newer we mean, she started at the end of last October (2018) and has taken over 50 classes; putting her at about 10 classes a month which is about one class every three days. So when we say "newer," we just mean she hasn't been ryding with us for long but she is in no way "new" to our bikes or workout! Michele crushes every class she attends. She works extremely hard and she has already done several "doubles!" Michele's "journey to Power Ryde" is different than most because she WON her first class in a raffle for our Breast Cancer FUNdraising Ryde! One of our awesome instructors bought an entry to the class, we posted about it on Facebook, Michele "liked" our post, and she was the lucky winner! 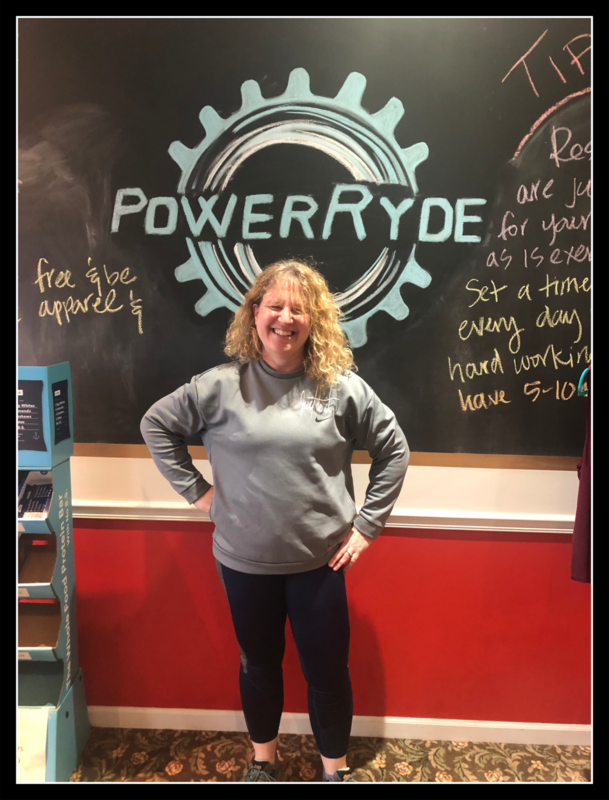 Fifty-plus classes and multiple FUNdraising Rydes later, Michele is still cycling, sweating, and strengthening with us at Power Ryde! Keep reading below to learn more about Michele, why she rydes, and some of her awesome goals for 2019! I always wanted to try Power Ryde. I had heard about it through some other moms who I volunteer with at school. But, I never made the time for myself to try it. My first ryde was the October Pink Ribbon Girls FUNdraiser for Breast Cancer awareness. I had seen a Facebook post for a raffle to win a spot in the class and I won! After my first class, I thought, "WHAT WAS I THINKING???" But, I was super impressed with the level of intensity of the class, the positive energy, and just how good I felt afterwards; even if I was pretty sore, I definitely wanted to try it again. What has kept you coming back for more week after week? I really like the bikes, the instructors, and just how great I feel afterwards. I feel like I'm getting stronger and improving my endurance. 3.the 2nd year I improved my time! I surprised myself! I am looking forward to doing it again this year and being even stronger and improving even more, in part because of Power Ryde. I would also like to try to push myself to try a triple ryde. I have done several doubles, but not yet a triple. The Police Unity tour FUNdraiser was memorable; it was emotional and a very worthy cause. I am glad that I was able to participate in it. I like upbeat, up tempo music that is fun to ryde to. I especially like 80's music (not that I'm old....) but songs that I can sing along to, even if it's to myself! But any upbeat music works for me! I grew up in upstate NY, the Adirondack mountains, in a small town on Lake Champlain, near Vermont and the Canadian Border. My husband and I moved to New Hampshire and lived there for 10 years before moving here to Ohio for P&G. We've been here 12 years and I personally appreciate the milder winters, but my kids miss the snow.....seriously, they miss the snow. My kids. My kids motivate me to push myself to be stronger and show them that you are never too old to try something new and go beyond your comfort zone. Growth comes when we open ourselves up to new experiences, even if we fall. From failure, comes success, never be afraid to fail. Learn from it and move forward! I LOVE to kayak! In the warmer weather I am kayaking, biking, and/or walking on the Bike Trail; I love being outside. In the winter, if I'm inside, I'm watching hockey with my family; we are CRAZY hockey fans!